On my way home from California on United Airlines on Friday February 22, 2013. 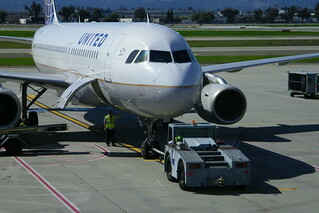 These were all taken at Norman Y. Mineta San Jose International Airport on a beautiful sunny winter day in San Jose. On was on my way home from visiting my dad who was in a hospital in Walnut Creek. Among the many cool things I saw were a few birds in the terminal. No doubt enjoying the seeds that have fallen off bagels and baked goods! Had a good amount of time at the airport after not getting on an earilier flight.